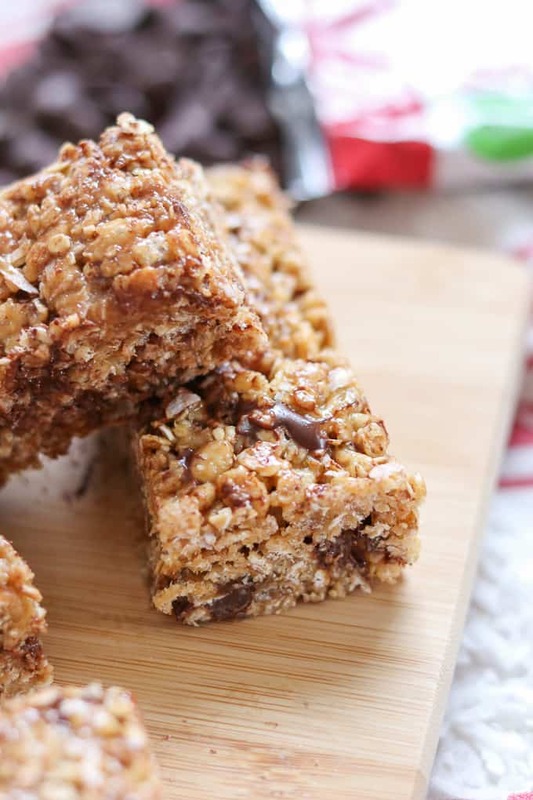 These No-Bake Rice Krispies Granola Bars are a perfect bite for breakfast on the go. 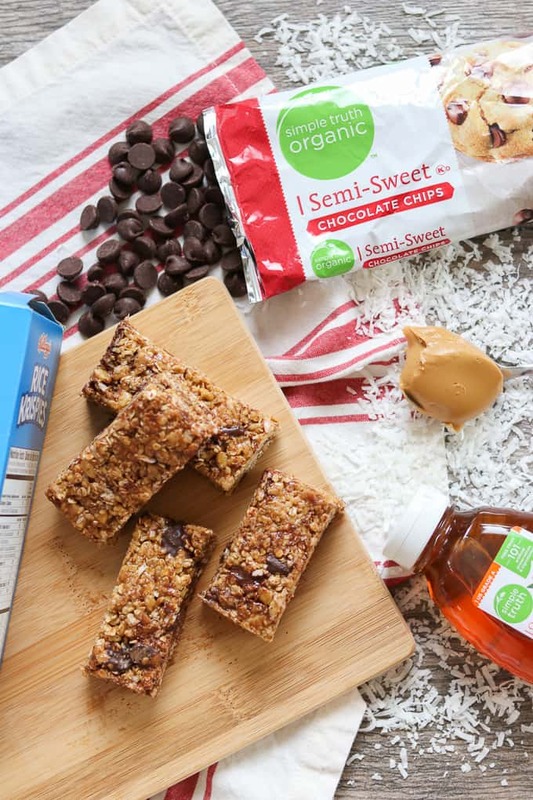 Soft, crunchy and slightly sweet, they’re made with Rice Krispies cereal, Simple Truth Orange Blossom Honey, Simple Truth Organic Semi-Sweet Chocolate Chips, oats, peanut butter, and coconut. 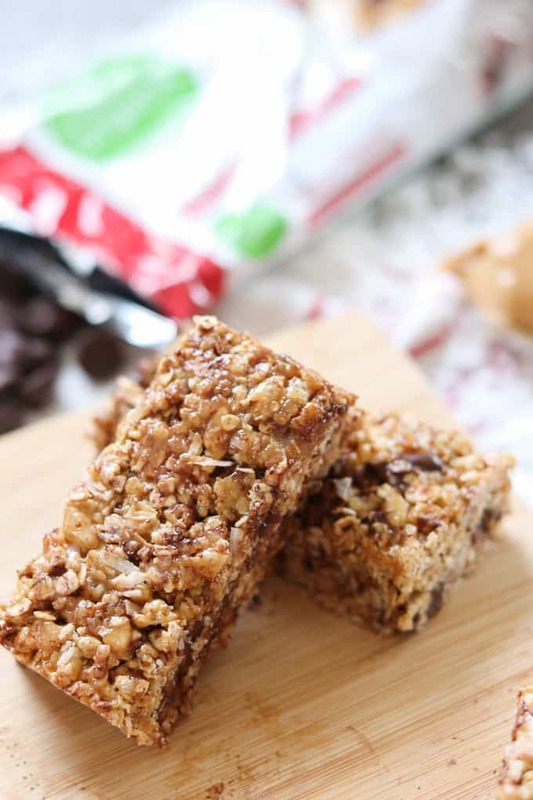 Grab a bar as you’re heading out to work or enjoy them as a mid-morning snack! I have to admit that I’m a lover of all things breakfast, and homemade granola bars are no exception. Do you love breakfast, too? It’s funny though, over the past year, I’ve found myself moving more toward the savory breakfast items as opposed to the pancakes, waffles and French toast loaded with the sweet fruit toppings I often ate years ago. I really think it’s because I’m getting older and am now watching more of what I eat. Really though, my sweet tooth just ain’t what it used to be. Don’t get me wrong, I’ll still enjoy a slice of Baked Blueberry Cream Cheese French Toast. There’s just something about having fruit with breakfast in the morning that I love. It’s seriously become my “thing” and breakfast just isn’t breakfast anymore without it. Since none of my kids will be home on Mother’s Day, I’m thinking I’m going to make a half batch of these Lemon Ricotta Pancakes with Blueberry Compote. They are SO freakin’ delicious. The pancakes are nice and fluffy, and the lemon and warm blueberry sauce go so well together. Man, I’m drooling now just thinking about them! Lately, I’ve found that these No-Bake Rice Krispies Granola Bars have been a great go-to snack when Kurt and I head out the door for our weekly Saturday hike. We have this standing date every Saturday where we drive to a different part of the state and hike a trail. It’s been a great way to spend time together, get some exercise and discover Arizona. I have to say that these bars have certainly come in handy and have certainly taken care of any hunger pangs. It goes without saying that I love the peanut butter and chocolate combination, and the coconut is a great addition. I also like that I can cut them into the desired sizes depending on how much or how little I want to eat. I’m not partial though. I’ll also eat them on the weekdays if I need to run errands. They’re both tasty and filling. When measuring the honey and the peanut butter, be sure to spray your measuring cups with some cooking spray FIRST. That way you’ll have more of those ingredients in the final product instead of left in the utensils. Measure the Simple Truth Organic Semi-Sweet Chocolate Chips and place them in the freezer. This will help them to not entirely melt when added to the warm cereal mixture. When mixing the warmed honey and brown sugar into the Rice Krispies and oats, I strongly recommend that you use a wooden spoon or other sturdy utensil sprayed lightly with cooking spray. I began with a soft spatula and quickly exchanged it for a wooden spoon. I’ve found that it’s best to refrigerate any leftover bars. It keeps them cool and prevents the chocolate from melting, especially in the hot summer temps. Don’t have those yet? I know, but you know they’ll be here soon enough! 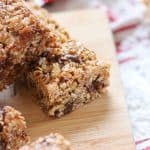 I found all of the items to make this no-bake granola bar recipe at my local Kroger which is Fry’s Food Store here in Arizona. I bet you have a Kroger near you, too! Can I just tell you how much I love them? I know every time I walk into the store I’m going to be greeted warmly by their employees who will go out of their way to locate a product if I’m having trouble finding it. I am always pleased with the quality of produce which is uber important to me because we eat a lot of fruits and vegetables. Each time I walk down the aisles I am in awe of the selection of products, too! More often than not I find myself reaching for Kroger’s own Simple Truth and Private Selection items. They’re great quality products at an affordable price. I know I’ll never be disappointed when I use any of those items in my recipes. I visit one of Kroger’s recipe sites, LetsEatBreakfast.com when I’m looking for more breakfast ideas. This is where I found these No-Bake Rice Krispies Granola Bars and knew immediately that I had to make them. There are also other great grab and go recipes in addition to smoothies and more. Click on the link and I think you’ll find there’s something for everyone. They also have a beverage site that has a lot of great drink recipes to go along with any meal of the day. Take a look and you’ll find lots of great ideas to quench that thirst all year long and even for the holidays, too! I’m always on the hunt for more grab n’ go recipes for our weekly hikes. I’ve added these Low-Carb Egg Muffins to my must-make list. They look delicious and are a great way to get your protein first thing in the morning, too. Who can pass up one of these Bacon Cheese Breakfast Muffins? I definitely know I wouldn’t be able to. Bacon is my soul food! 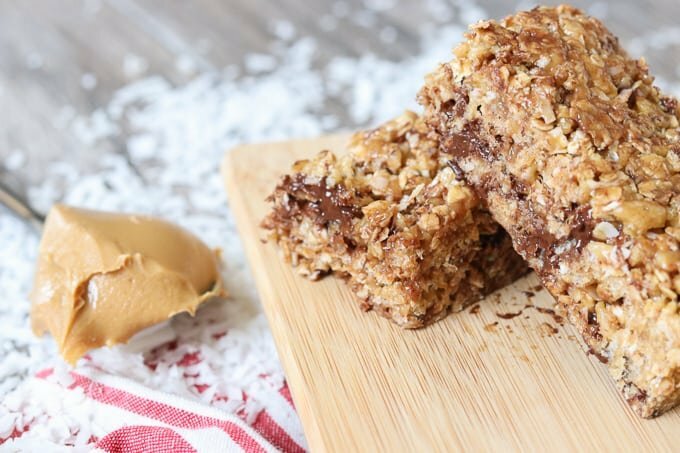 These No-Bake Rice Krispies Granola Bars are a perfect bite for breakfast on the go. 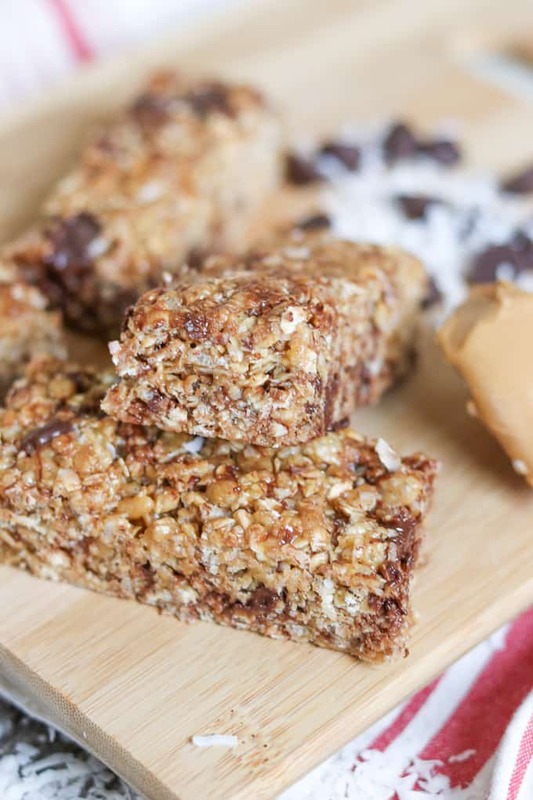 Soft, crunchy and slightly sweet, they're made with Rice Krispies cereal, honey, Simple Truth Organic Semi-Sweet Chocolate Chips, oats, peanut butter, and coconut. Grab one as you're heading out to work or have one a mid-morning snack! Spray an 8”x8” baking dish with nonstick cooking spray. In a large bowl, combine the Rice Krispies and oats. In a medium saucepan over medium heat, stir together the brown sugar and honey until just boiling. Remove from heat and stir in the peanut butter and vanilla until well combined. Pour over the dry ingredients in the bowl and mix with a wooden spoon until combined. Mix in the coconut flakes and chilled Simple Truth Organic Semi-Sweet Chocolate Chips. Pour mixture into prepared baking dish and with a silicone spatula, press until it is evenly distributed. Slice bars into the desired size and place into the refrigerator to chill until firm. Made for me and my son ! Thank you ! Just made these babies! Perfect mix of honey, peanut butter and chocolate. Can definitely taste all 3 but not overwhelmed by any one. Melting the brown sugar with the honey… Great idea! Thank you! So glad you liked them, Amy! Thank you so much for letting me know!